The Canadian Bible Society Ontario and Nunavut Regional Director, Rev. Lisa Pak, had the pleasure of delivering Catholic Bibles to Cris Smith at the Sara Elizabeth Centre. 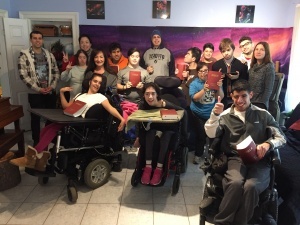 During the time there, Lisa learned about the day camp/program that operates for disabled youth and young adults where each person is provided with a Bible. Time was spent at the Circle of Friends session which gave Lisa the opportunity to play a song for everyone.